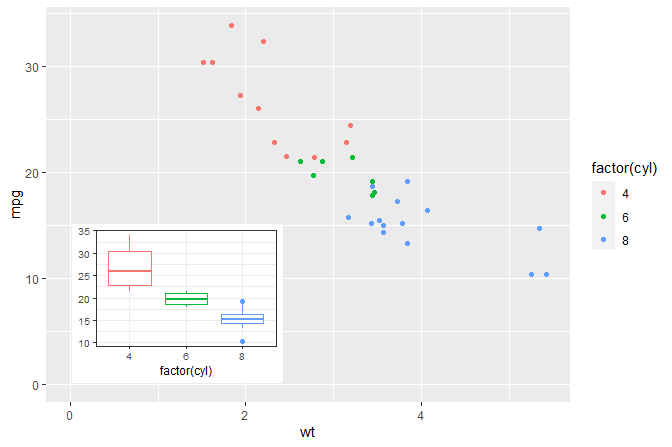 Package ‘ggpmisc’ (Miscellaneous Extensions to ‘ggplot2’) is a set of extensions to R package ‘ggplot2’ (>= 3.0.0) with emphasis on annotations and highlighting related to fitted models and data summaries. Data summaries shown as text, tables or equations are implemented. The location of such summaries in the plotting area is usually set independently of the x and y scales. The same applies to plot insets and logos and other arbitrary graphical elements. The “natural” coordinates to use in such cases are expressed in ‘grid’ “npc” units in the range [0..1]. Geometries geom_table(), geom_plot() and geom_grob() make it possible to add inset tables, inset plots, and arbitrary ‘grid’ graphical objects as layers to a ggplot using native coordinates for x and y. Geometries geom_text_npc(), geom_label_npc(), geom_table_npc(), geom_plot_npc() and geom_grob_npc() are versions that interpret x and y values as if expressed in “npc” units. 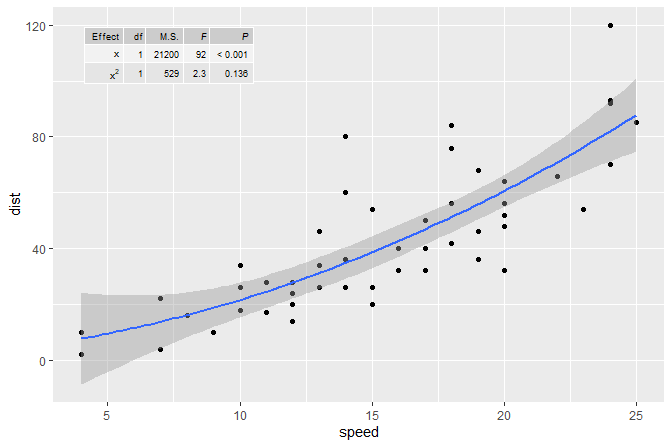 Statistic stat_fmt_tb() helps with the formatting of tabbles to be plotted with geom_table(). 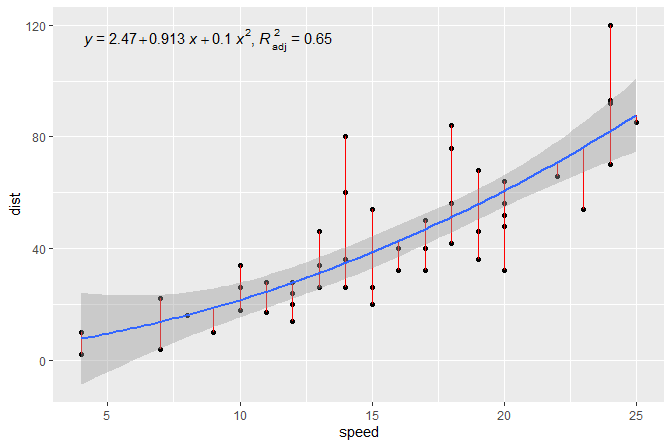 Statistics stat_peaks() and stat_valleys() can be used to highlight and/or label maxima and minima in a plot. ggplot constructors for time series objects. The provided ggplot.ts() and ggplot.xts() use try_tibble() which is also exported and accepts objects of additional classes as input. Statistics that help with reporting the resulst of model fits are stat_poly_eq(), stat_fit_residuals(), stat_fit_deviations(), stat_fit_broom(), stat_fit_broom_tb(). A summary statistic using special grouping for quadrants stat_quadrant_counts() can be used to automate labelling with the number of observations. stat_apply_panel() and stat_apply_group() can be useful for applying arbitrary summary functions. Two statistics, stat_dens2d_filter() and stat_dens2d_label(), implement tagging or selective labelling of observations based on the local 2D density of observations. These two stats are designed to work well together with geom_text_repel() and geom_label_repel() from package ‘ggrepel’. Being ggplot() defined as a generic method in ‘ggplot2’ makes it possible to define specializations, and we provide two for time series stored in objects of classes ts and xts which automatically convert these objects into tibbles and set the as default the aesthetic mappings for x and y. A companion fucntion try_tibble() is also exported. Functions for the manipulation of layers in ggplot objects and statistics and geometries that echo their data input to the R console, earlier included in this package are now in package ‘gginnards’. 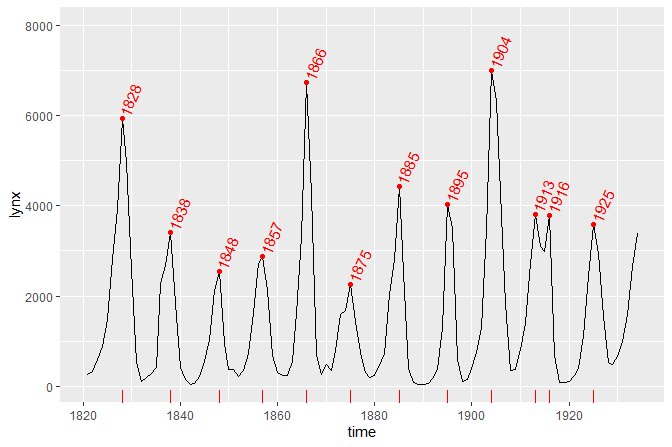 In the first example we plot a time series using the specialized version of ggplot() that converts the time series into a tibble and maps the x and y aesthetics automatically. We also highlight and label the peaks using stat_peaks. In the second example we add the equation for a fitted polynomial plus the adjusted coefficient of determination to a plot showing the observations plus the fitted curve, deviations and confidence band. We use stat_poly_eq(). The same figure as in the second example but this time annotated with the ANOVA table for the model fit. We use stat_fit_tb() which can be used to add ANOVA or summary tables. A plot with an inset plot. HTML documentation is available at (https://docs.r4photobiology.info/ggpmisc/), including a User Guide. Please report bugs and request new features at (https://bitbucket.org/aphalo/ggpmisc/issues). Pull requests are welcome at (https://bitbucket.org/aphalo/ggpmisc). © 2016-2019 Pedro J. Aphalo (pedro.aphalo@helsinki.fi). Released under the GPL, version 2 or greater. This software carries no warranty of any kind. Developed by Pedro J. Aphalo.